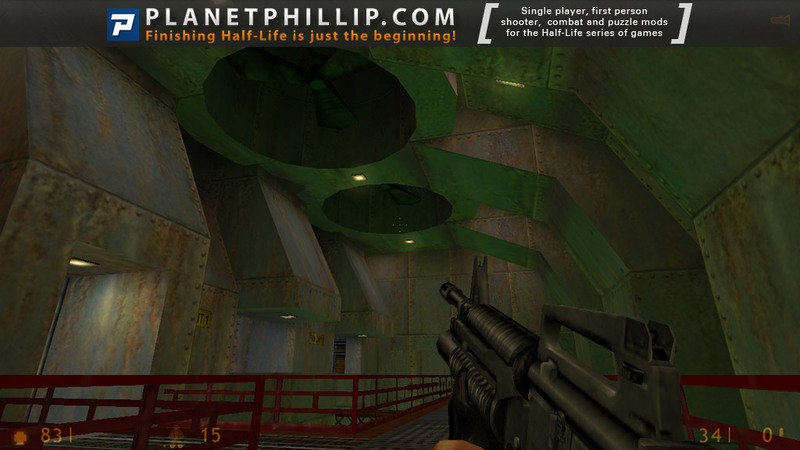 One night, Gordon Freeman was going home from work. It was late at night and he was in a hurry. The car’s engine purred quietly and inside was pretty comfortable. Beyond the car’s window was a cold, cold night and black mountains against a dark sky could be seen in the background. He was listening to a local station on the radio and was on the last stretch of his journey; the two canyons and the torturous mountain road. He passed the first canyon with no trouble over the new bridge. It was the second one that sometimes caused problems, as the wooden bridge was over 30 years old. And, unfortunately for Freeman, today was the day it collapsed! His car fell to canyon floor and Freeman lost consciousness. Coming to, Freeman found himself in the water near his car. This was January 2017’s Classic of the Month mod. 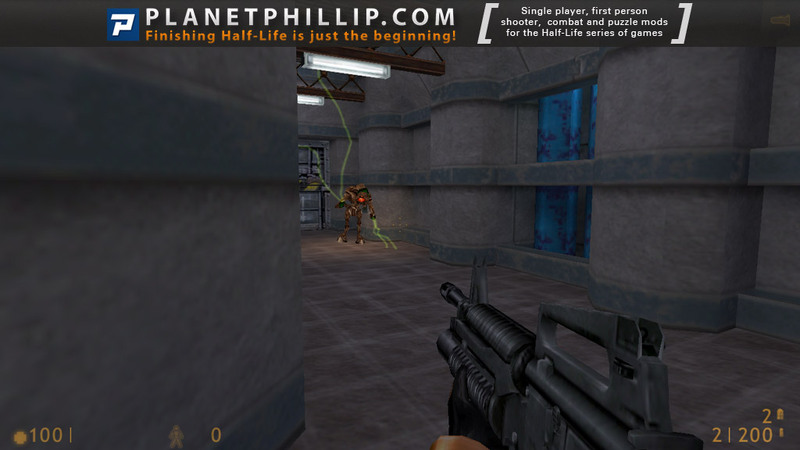 Copy the prisonerofevent folder into your Steam Half-Life folder. Prisoner of Event should now be listed in your Library tab. I loved this mod. 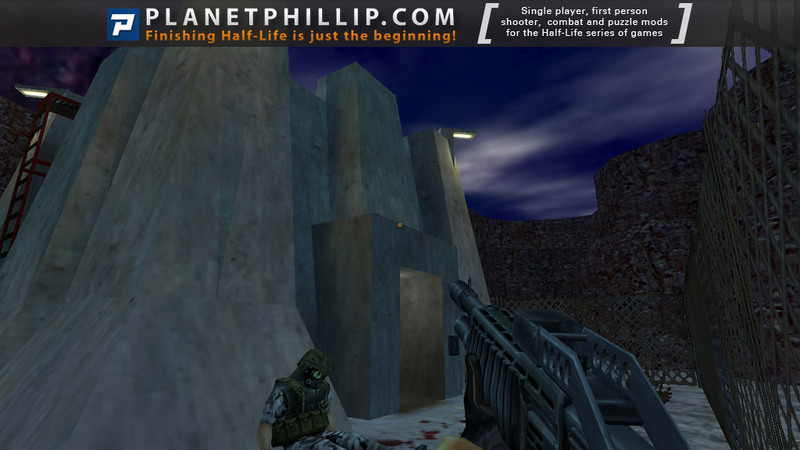 It was the right length for me, had a Black Mesa setting, a few buttons to press, some nice enemy locations and just enough ammo. For such a small file size you get everything quite a lot of gameplay. I didn’t get into the small security room and forgot to go back and try again. My only complaint is that it didn’t have a crowbar and I feel that every BM style mods should have one. Anyway, I got, stuck right at the beginning, between some rocks but a quick reload solved that. The canyon after the rocks is great (image 03), as is the building (image 04) and I felt a thrill of expectation as I descended. A great little mod with some nice layouts – well worth your time. 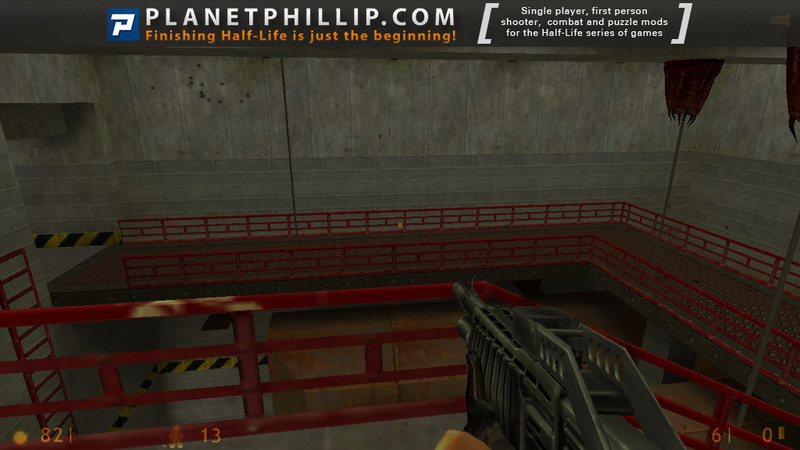 This is the second Half-Life mod I’ve played. The first was The Silo Station. There are beautiful and original canyon and bunker waiting for us. There is a secret place – the guard’s room, it is seen behind the glass that there are batteries and ammunition. It is sad that this mod ends abruptly and we will never find out what happened next. However, I like it for impressive architecture and interesting exploration. Again, this is one my favourite addons. I love the beginning. 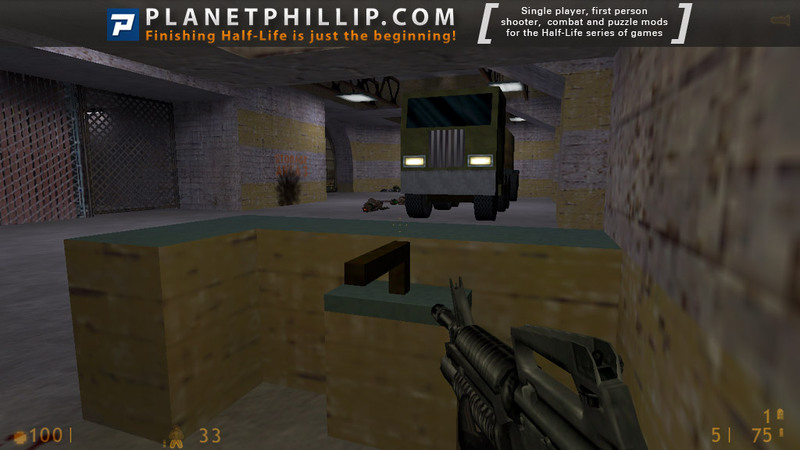 A really, really good map pack with some impressive level design easily on par with Valve together with some solid and fun combat. Taking in consideration that this was made in 1999 makes it even more impressive. One of the best bits about this map pack for me isn’t just the actual design of the maps and combat but the fact that the author almost perfectly balanced the ammo ratio throughout it. When you’re running out of ammo and think for yourself that you’re going to have to resort to grenade throwing you spot a ammo pack just in the brink of time. This makes combat so much fun instead of having loads of different ammo types all fully loaded for its corresponding weapon. Some criticism would be pointed at the beginning; the crowbar is very easy to miss as I did on my playthrough and had to break crates and vents with my firearms. Also, even though the ammo ratio is almost perfect the map pack is overall a bit too easy since you get a lot of health packs/stations and batteries. As such a playthrough on hard is recommended. A great mod with two massive flaws. It’s so sad that I have to give such a great and enjoyable mod a “Think Twice”. I really should be giving it a “Play it Now” or “Personal Favourite”. The action of this mod was superb. Instead of using the shotgun and 9mmAR all the time like you do in most of the mods, this one requires you to improvise and use grenades as you would a normal weapon in some areas, like in Radix. It’s also challenging in areas, for example the area with an Alien Grunt and Vortigaunt on one side and you are on the other side. I also liked the fact that you can get to the acid removal button without having to go all around the building. Multiple ways are always fun. Time to get to the main flaws. Like in Phobos you do not have a crowbar and so if you run out of ammo you are screwed. The other flaw which makes this worse is that there is very little ammo. I ended up running past headcrabs and shooting the Vortigaunts and Alien Grunts without missing or taking damage. This makes me wonder why I gave Phobos a higher rating than this because this was much better. I guess I’ll have to redo my review for Phobos. The action is fun but the lack of crowbar ruins it. Of course, me being an idiot I just realised that some of the other reviews pointed out that there IS in fact a crowbar on the map. Silly me. The author of this mod still should of made it so that the Crowbar is near enough unmissable and so that is why it gets a “Play it Now” instead of “Personal Favourite”. My favourite of the 100SDoN so far. It wasn’t until I got to the tower I realised I’d played this before a long time ago. 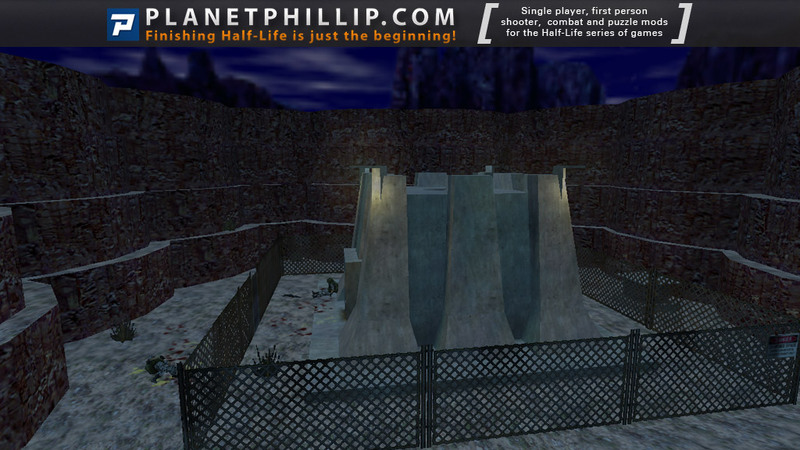 For the time it was a great map and it still stands the test of time. Yes it’s a bit blocky by today’s standards but its still very playable and I enjoyed playing it again. There was enough ammo and health to allow a smooth flow but the canyon at the beginning could have been shorter or a few hazards included. Fortunately I found the crowbar near the car so I could get to the canyon. For the time this was made this stands head and shoulders above many of its contemporaries (not all but many) its just a pity it was never finished. What I’m curious to know is how people missed the crowbar as it is not hidden. 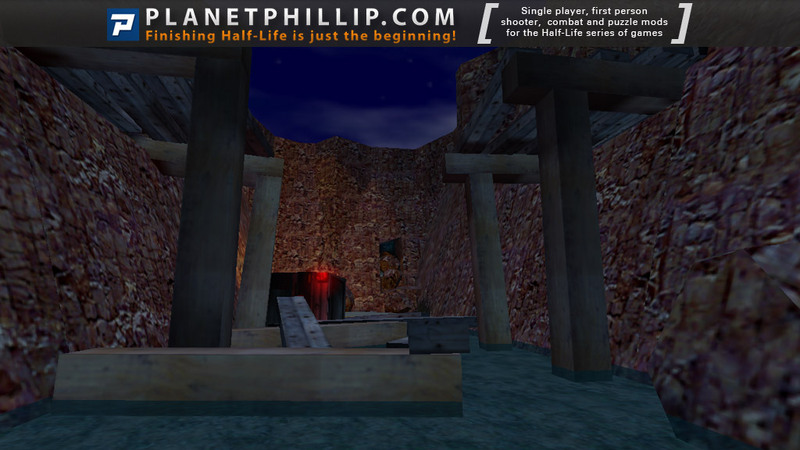 As discussed above, there is a crowbar at the start and it’s a fault of the design not to require the player to pick it up before leaving the first area. 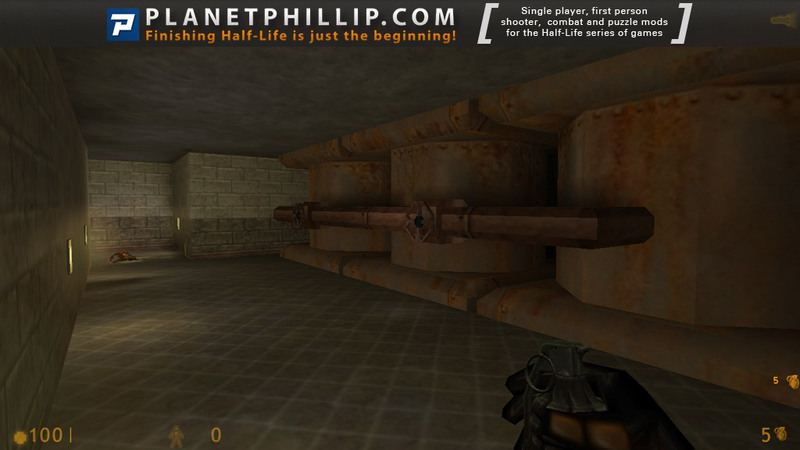 This is a very solid 3-map pack set in Black Mesa or at least a similar facility. 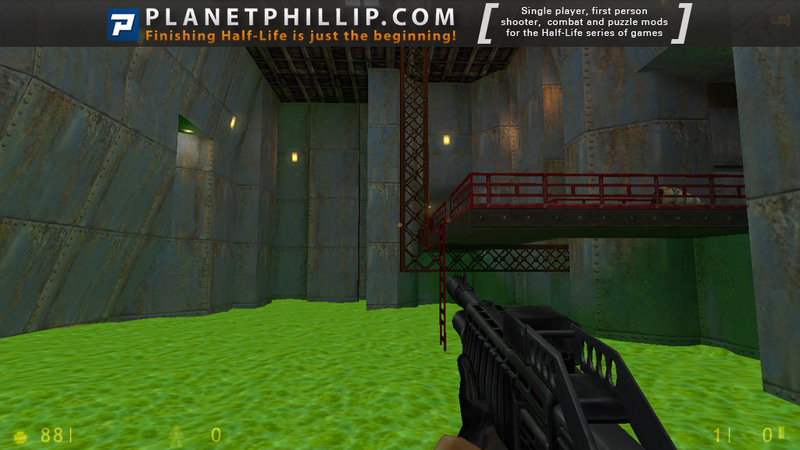 It looks really good, especially being from 1999 and using stock textures. The combat is fun, you’ll be facing all aliens for once which is a nice break from the norm. And it’s nice that you’re rewarded for breaking nearly every single crate (and there are a lot) with ammo, armor, or health. The balance is good, with your main enemies being a mix of slaves and alien grunts which are no slouches especially on the difficult setting. I like the multiple paths you can take and the side areas – it’s not labyrinthine though, and it doesn’t force you to diverge from your main path to explore, although you’re rewarded for doing so. The faults? The aforementioned crowbar situation is one. The areas tend to look a little repetitive in the middle section and I actually got crossed up and headed in the wrong direction for a while before realizing I’d been through there before. There’s no real story to speak of (Gordon wrecked his SUV on the way home one day) and there’s not a satisfying ending. Okay, I have just replayed the end section and I can’t find a way into the security office. perhaps you are not supposed to. Anyway, there’s no vent or other way inside but the control panel on the wall opens the door from the inside. I have tried closing the main doors on the area below and also further on, flipping the switch which opens the shutters but neither helps. Has anybody found a way in? You mean the booth with the dead security guard just outside? You can get in there a bit further on in the area that is split in two with a hole in the middle that also has that green slimy water and a bullsquid at the bottom. Jump down there and check the small area that the bullsquid stood in and there should be a small entrance with a ladder inside. Just keep going forward while dispatching the headcrabs in the vent until you drop down into the security booth. Yes, to get in the security booth you go into the pool with the leeches (and bullsquid) and at one end is a ladder up to some vents. It ends in the ceiling of that room and you can grab the stuff, but new enemies come along outside and you’ll have to retrace your steps a bit. I enjoyed this one, although there’s not much of a plot, the action makes up for that. 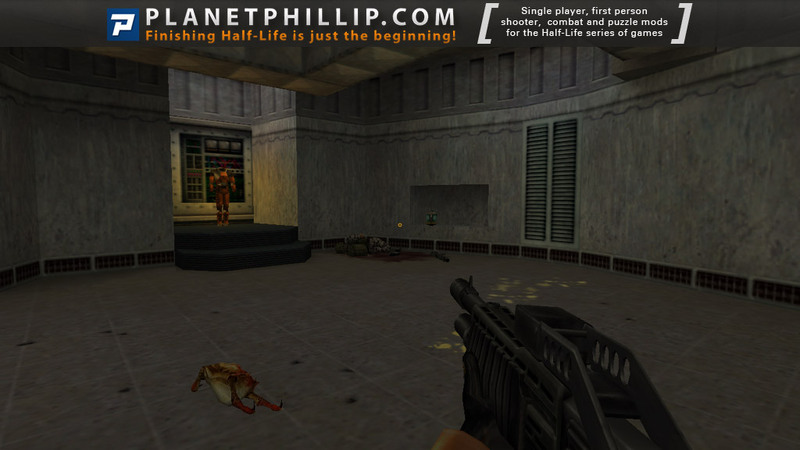 The mod flows from one encounter to the next without getting boring or repetitive, with plenty of encounters well match with ammo and health, allowing the pace to zips along in classic HL1 style. The set designs were typical but sound, appearing realistic and convincing in layout and textures. You get to ride the train, for I think, the first time this summer, but unfortunately the fun is too short lived, leaving you wishing for more. More then happy to rank this better then my original posting, however, anything beyond a PIL requires a bit more content, longevity and maybe a storyline, possibly some original and creative content. Just to add that my notes show H16 ranked this 6/10 with EH10 scoring it 6.8/10. OK I have the feeling here that we have a quality piece, maybe, because is product of a competition from year 97!!!! about 14 years of this, oh god and is still feeling fresh as a gorgeous lettuce!, I mean, that’s why this mod should be at the top, because is so well designed, and it feels like original HL1 playing, so that’s why I loved it, altough I know getting the crowbar could be hard becauseit was so well hidden underneath, those big wood sticks fallen from the bridge, and rocks, indeed myself I didn’t see the crowbar at all, it just stteped by when I passed walikng there, I didn’t explore too much at the first, and that’s why I haven’t the crowbar! !, which surelly with it should have been so more fun, I loved the battles, but most of all, the mapping layout very clever, and with a great environment!, the lenght for this mod was just right, and that’s why is also sweet to play it, but on the other hand, that could be an inconvenient because you want more good quality action even if it’s just a bit minutes more of it! I would love to see the other 2 mods that compited into that competition, because if this was cool, the other 2 must be even cooler! 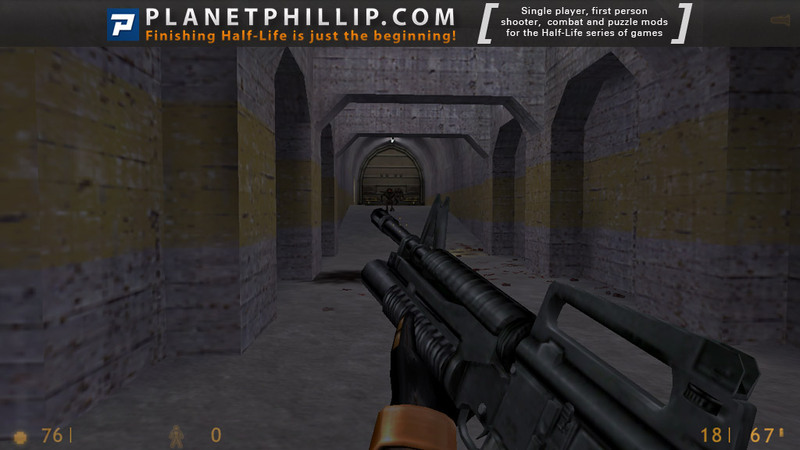 !, also I think moding competitions gave us really some good pieces, so I think if Phillip runs a HL1 comp. surely we could see really cool maps!! Oh I almost forgot!, I loved the main structure where the mod beggins, is so cool, in a kind of CMB style, but so much before we had the CMB invassion, so that’s a really cool detail, also the part when u drain the green liquid and, voila! 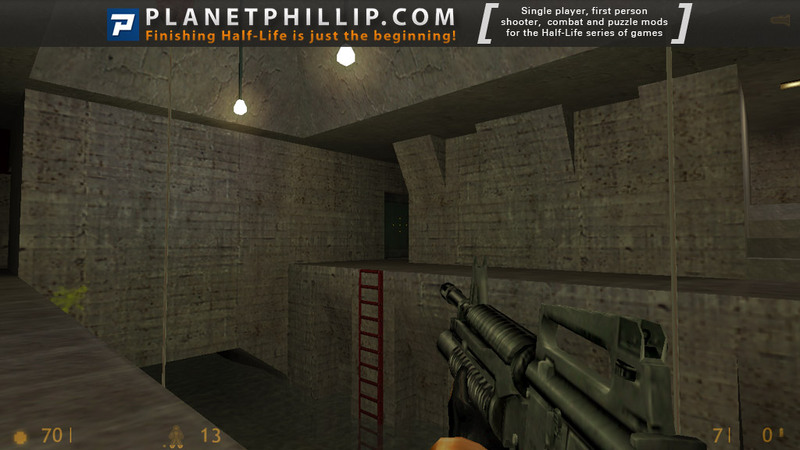 !, another great mapping section appears, is just brilliant!, so u must play this!! Was surprised to get a few hits from this site on my humble site. Was even more surprised to see this old rusty level reviewed and people actually enjoying it these times! 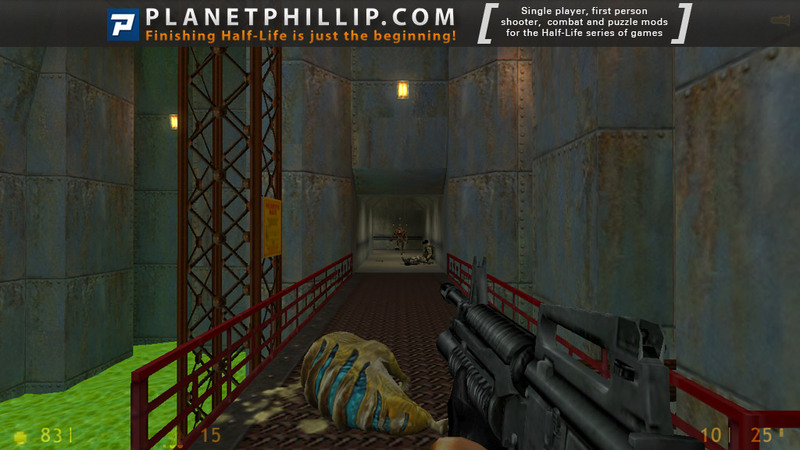 It all turned me to fire up HL1 and replay this 12 year old level, was kinda fun and felt nostalgic. Though I wonder how people managed to miss crowbar. I put it on the path near spawnpoint. That was designer” mistake it seems, I had to emphasize its placement somehow. I liked playing this little mod, though I will say I must have missed a lot of things due to not trying hard enough to explore different locations. I never got into the security booth, at any rate. I will say that I kept having to restart the game at the beginning because I kept getting trapped between boulders. Not just one of them, but several different locations where a small enough gap existed to fall into, and just not enough to climb back out. Again, I think there is nothing new I can say. I never have been so on the fence about a mod as I do now. 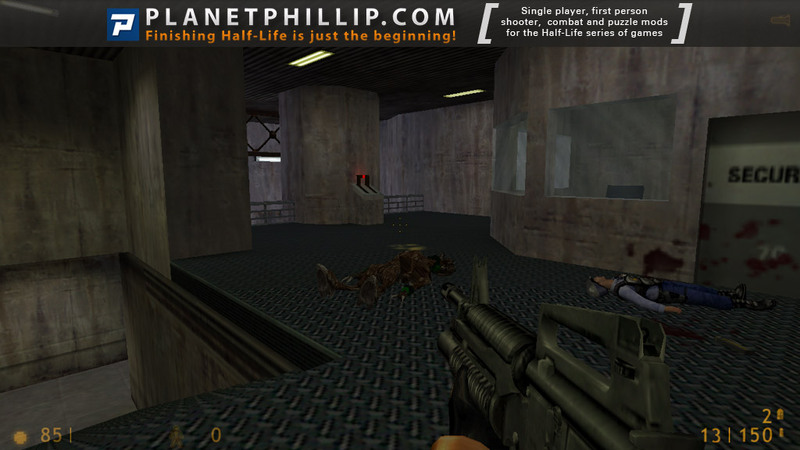 It lacks any storyline but like any hl1 mod it doesn’t matter. It has some good level design and has 2 path ways to go about doing it, one that makes you go a long way and another that gets you straight to the objective. It has a nice start (a car crash is always one I like as its not done often and you get to see some rough terrain), it has good level design and its ammo is scarce (which I love it when mods does this as it makes the player think as to how to utilize it best and give the crowbar some love). But the mod just sort of ends.. No real reason for it and no conclusion, and it was very short. Short mods always get way to generous a score. its easy to make a really good short mod, a long mod requires consistency in its design and thats when most modders find it difficult to bring quality gameplay. I can’t give it more then 3 stars for a mod that barely passes the 10 minute mark. Very short minimod, but filled with nifty ideas such as the design, combat and atmosphere. All in all, if you have spare time for same “braindead” action, go play it, it’s worth it! 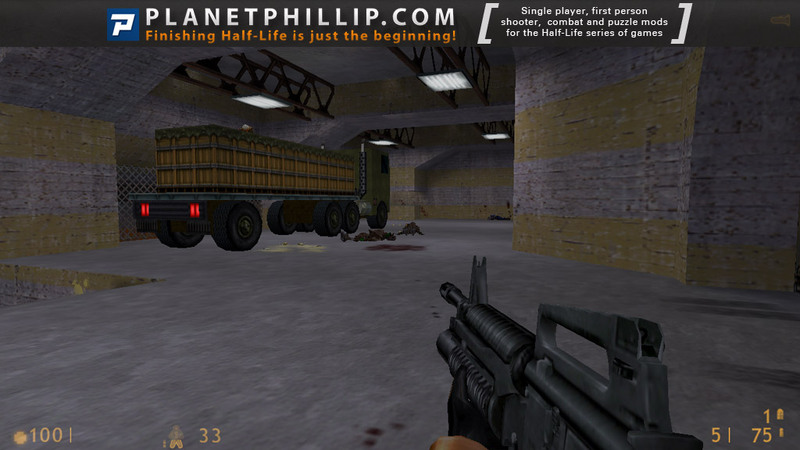 -Balancing – there IS lot of ammo and the combat is average, play on hard! 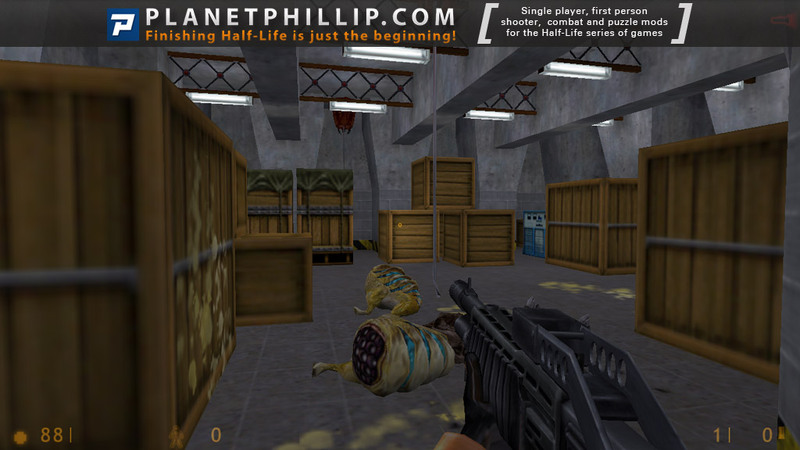 Prisoner of Event is Vondur’s one and only Half-Life single player episode, though he has released a number of single player and deathmatch maps for the Quake games. This includes two Quake packs reviewed here at Ten Four: The Castle of Koohoo and the massive Nehahra, for which Vondur was one of the mappers. Though Prisoner of Event felt a bit inconsistent in its design, it also shows some flashes of great layout. But overall it leaves you wanting more. 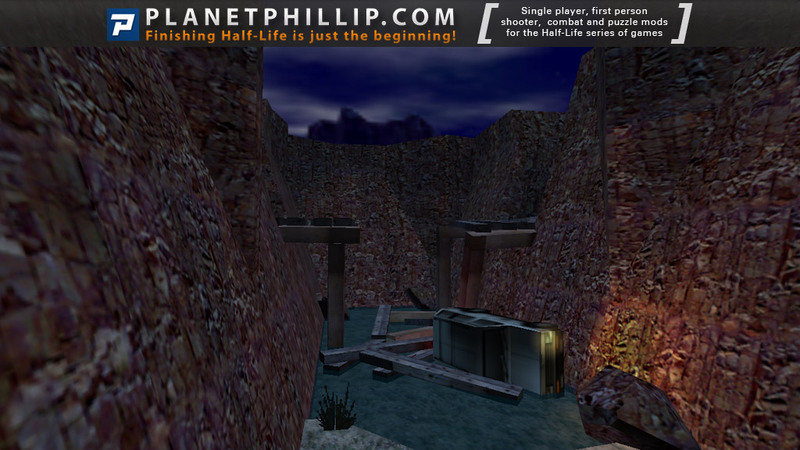 A simple background is supplied – you, as good ol” Gordon Freeman, are on your way home when the bridge you are on collapses, leaving you trapped but unharmed in a canyon. From there you stumble upon a (what else?) base in the desert where some Xen aliens are up to no good. This review is republished here by permission and was originally published Saturday, 4th August, 2001 by Unquenque. This is another BM style classic. We start in a wrecked car which, somewhere near there is a crowbar so don’t get confused people. The combat is good, the atmosphere was great and the textures are well placed. Not a lot to say. Though, the only problem I have is that the ending is very disappointing. 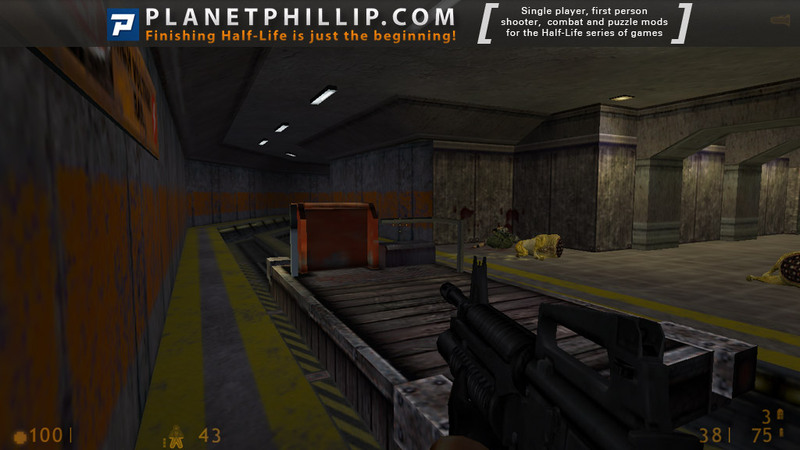 This small half life mod is really fun to play when you have nothing to do! 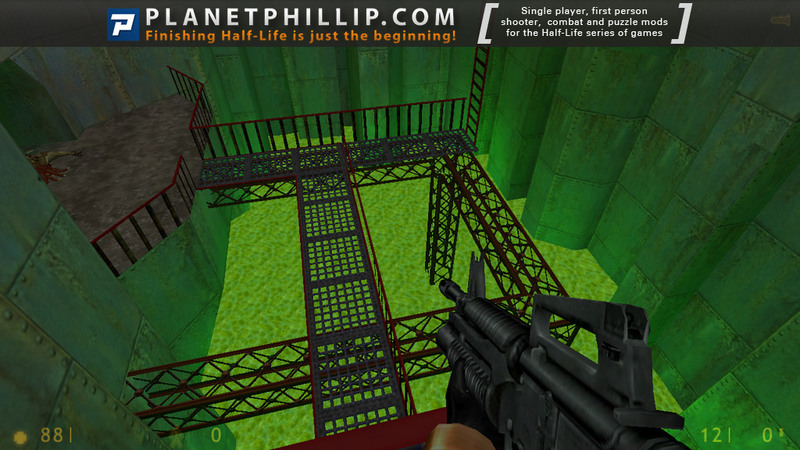 The level design is a half life level design, simple! But it’s the level design we all love in this marvelous game! 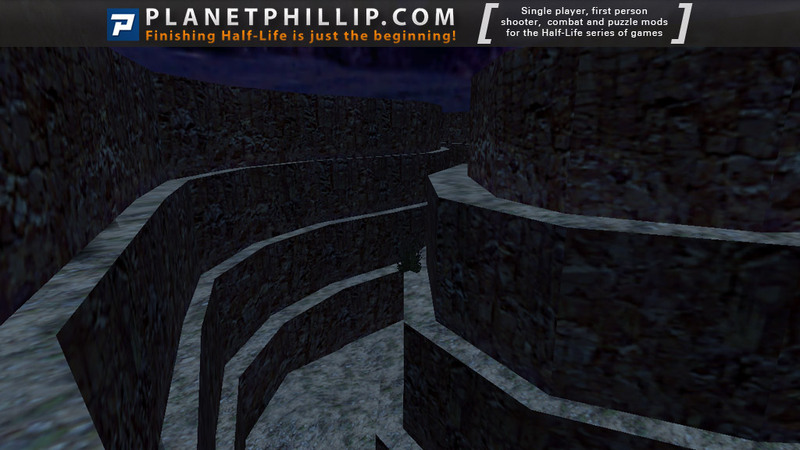 However, The LOD is really good for a half life maps! And the lightning is really good as well. The story is a small and quick story. This is not what the mod have been made for! And I’m not sure if I really understand it, but hey, let’s be honest, this mod was just for the gorgeous combat! This mod turns around the combat against the alien and not against the soldiers. And, besides the author often uses the Alien Grunts, the mod is really easy. I’ve played on normal and if you are an aggressive player, it will be pretty easy!